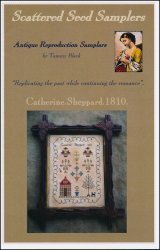 Catherine Sheppard 1810 [G1337] - $12.00 : Yarn Tree, Your wholesale source for cross stitch supplies. Cross stitch pattern by Scattered Seed Samplers. This reproduction of an 1810 pattern features a house, floral motifs, and a a tree. Stitch count 127w x 167h.